In the U.S. where school shootings are not just a fear but a devastating reality, the title for the comic sci-fi manga series is unfortunately misunderstood by many unwilling to delve into its pages. Assassination Classroom is not about the real-life violence that plagues schools, but rather a class of misfit students pledged with saving the world by killing their alien super-villain teacher (who has already blown up a decent chunk of the moon). It seems clear that this situation that the parent and the school leadership took the manga and its title out of context, likening it to the genuine epidemic of school shootings, even though it is a fantastical work of comedy and science fiction that has nothing to do with that problem. And while a parent has every right to say they don’t want their child reading something called Assassination Classroom, they don’t have that right to make that book unavailable to other students. Some of whom may find the storylines of students who don’t excel at school being earth’s only hope and of a tentacled super villain teacher being the first to believe in this underdog class resonating to their own experience. 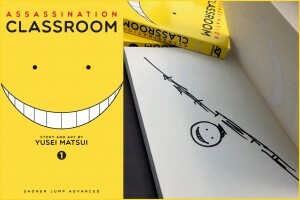 Want to read Yusei Matsui’s Assassination Classroom? There’s still a few hand-signed copies available for CBLDF supporters! Make sure to follow us on Facebook, Twitter, Instagram to keep up with First Amendment news as it happens!